The United States Hockey League announced the Forwards, Defenseman and Goaltender of the Week for Week 3 of the 2018-19 season. 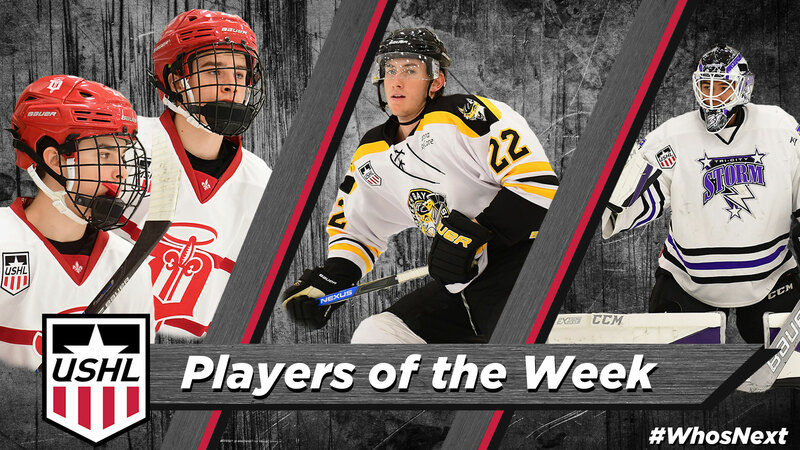 Dylan and Ty Jackson of the Dubuque Fighting Saints were named Co-Forwards of the Week while Nick Leitner of the Green Bay Gamblers and Isaiah Saville of the Tri-City Storm also took home weekly honors. The Jackson twins recorded five points each in Dubuque's two wins over the weekend, Leitner dished out five assists in a pair of Green Bay victories and Saville recorded his first USHL shutout in his lone start of the weekend on Friday. The USHL is America’s only Tier 1 junior hockey league, and continues to lead the world in the advancement of Division I college hockey athletes. The Jackson twins dominated offensively for the Dubuque Fighting Saints, leading their team to victories both Friday and Saturday. In Friday's 5-3 victory over Lincoln, Dylan scored twice and added an assist, while Ty scored his first USHL goal, the eventual game-winning tally, to go along with two helpers of his own. In Saturday's 7-2 triumph of the Omaha Lancers, both Dylan and Ty recorded one goal and one assist, with Dylan scoring the game-winning goal. 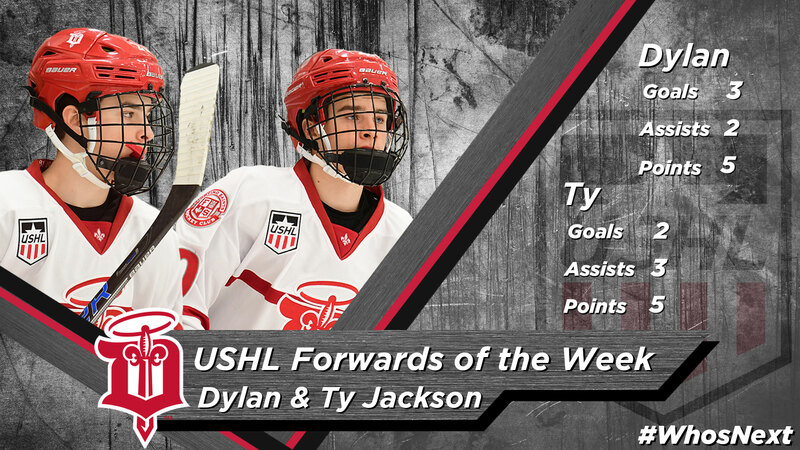 Ty has tallied six points (2G, 4A) on the year, putting him in a tie for third among all USHL rookies in scoring. Dylan is right behind with five points (3G, 2A) thanks to his outburst over the weekend, placing him in a tie for sixth in rookie scoring. Ty and Dylan also sit second and third, respectively, among all Dubuque players in scoring. The Oakville, Ontario natives are committed to Northeastern University and previously played for the St. Michaels Buzzers (OJHL) and Missasauga Rebels (GTMMHL) prior to their time in the USHL. Both players were selected by Dubuque in the 2017 USHL Phase I Draft. Ty was chosen in the fourth round, 61st overall, while Dylan was selected soon after in the fifth round, 75th overall. Leitner dished out three assists in Green Bay's 6-2 win at Central Illinois on Friday before adding two more helpers as the Gamblers knocked off the Waterloo Black Hawks 5-4 in overtime on Saturday. The Bemidji, MN native is now up to seven points on the season thanks to his big weekend. Those seven points (0G, 7A) lead all USHL defenseman in scoring and are tied for fifth among all USHL players. 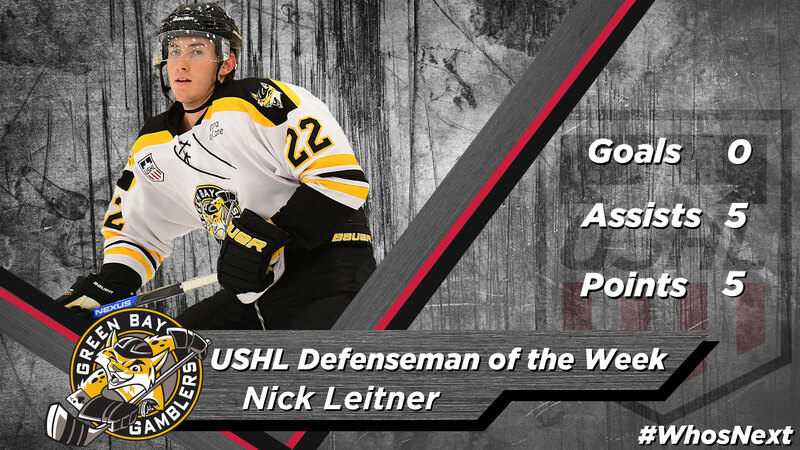 Leitner is also tied for the Gamblers' scoring lead. Prior to his time in Green Bay, Leitner spend two seasons (2016-18) with the Des Moines Buccaneers, recording 12 points (2G, 10A) in 86 games to go along with a +11 rating. He suited up for Bemidji High (MN) prior to coming to the USHL before the 2016-17 season. Leitner was selected in the second round, 18th overall by Des Moines in the 2016 USHL Phase II Draft and was acquired by Green Bay via trade on May 1. Saville earned his first USHL shutout in his only start of the weekend, stopping all 25 shots he faced to lead Tri-City to a 3-0 win over the Des Moines Buccaneers on Friday. The rookie netminder has started three of the Storm's four games between the pipes and has been outstanding, allowing only two goals on 67 shots through those three contests, giving him a stellar 0.67 GAA and .970 SV% and helping Tri-City to allow the fewest goals against (6) of any team in the USHL. Saville's 0.67 GAA and .970 SV% lead all USHL goaltenders, an impressive feat for a rookie even through three starts. The Anchorage, AK native is committed to the University of Nebraska Omaha, was named to the NHL Central Scouting Preliminary Players to Watch List earlier this month and participated in last month's USA Hockey All-American Prospects Game. 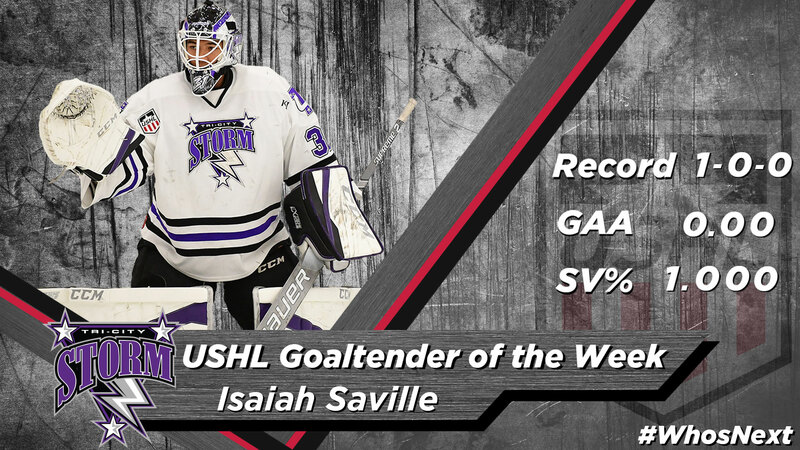 Saville spent the 2017-18 season with the NAHL's Minnesota Magicians, where he posted a 2.41 GAA and .927 SV% en route to being named to the All-NAHL Second Team. Before his time in junior hockey, Saville played for the Colorado Thunderbirds (T1EHL). He was acquired by Tri-City from the Madison Capitols via trade before the 2018 USHL Phase I Draft.